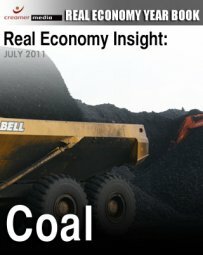 Creamer Media’s Real Economy Insight brief on South Africa’s coal industry details activities in the coal-mining industry over the past year, with a particular focus on supply and demand. A full summary of Creamer Media's Real Economy Yearbook – covering the Automotive, Construction, Electricity, Liquid Fuels, Steel, Water, Coal, Gold, and Platinum sectors – is also available from Creamer Media. To purchase a PDF copy of the full contents of the Real Economy Year Book click here.